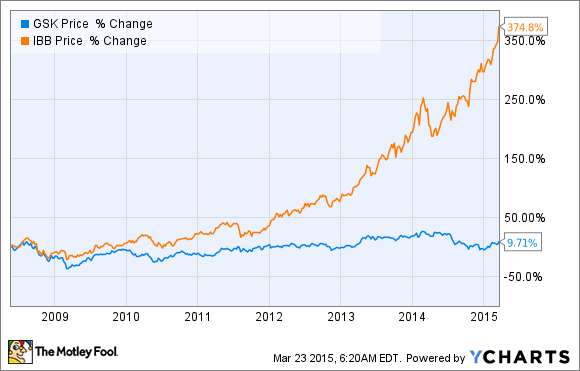 Is It Time for GlaxoSmithKline plc to Change Management? GlaxoSmithKline's share price has stagnated under CEO Andrew Witty. Is it time for a change? Big pharmas aren't exactly known for replacing top-level managers very often, especially CEOs. So when the French biopharma giant Sanofi fired its CEO Chris Viehbacher last year, industry insiders stood up and took notice. While there is some debate as to the exact reasons why Sanofi made such an unprecedented move, many felt that Viehbacher didn't set the company up for success past the looming patent expiration for the company's flagship diabetes drug, Lantus. With the patent cliff on track to claim roughly $65 billion in revenues from the broader industry over the next four years, we very well might see even more high-level shake-ups in the near future. GlaxoSmithKline (NYSE:GSK), for instance, has already started making changes to its Board, replacing chairman Christopher Gent with Philip Hampton. And some have speculated that the British pharma giant's CEO Andrew Witty could be next. The bigger problem, though, is that Glaxo looks somewhat lost in relation to its biopharma peers, many of whom are racing to develop next-generation cancer, cholesterol, and infectious disease treatments. Glaxo, by contrast, has given up on its immunotherapy aspirations after MAGE-A3's last failure, and its core respiratory portfolio will only continue to lose market share as Advair comes off patent protection in the U.S. Indeed, the only significant move the company has made lately in an effort to stem the tide is to swap its oncology assets for a portion of Novartis' vaccine portfolio -- an underwhelming $21.5 billion exchange in the eyes of many investors, especially since this particular group of vaccines saw their sales drop by double digits at one point last year. Should Glaxo replace its top executive? Under Witty's watch, the company has tried to replace aging assets like Advair with homegrown clinical candidates or through research agreements with smaller biopharmas. As shown by the MAGE-A3 example, though, this strategy simply hasn't paid off. In fact, the pharma giant saw revenue decline by a stunning 16% year-over-year, according to its fourth-quarter earnings report. Aside from its joint venture HIV business ViiV Healthcare, co-owned with Pfizer and Shionogi, Glaxo doesn't have much in the way of exciting new products. Glaxo also had to drastically slash the price of its new respiratory medicine, Breo Ellipta, to placate insurers last year, although this decision has reportedly resulted in a nice uptick in sales. The issue at hand is that Glaxo has shied away from the widespread "growth-by-acquisition" strategy that has worked like a charm for companies like Actavis/Allergan, Gilead Sciences, Valeant Pharmaceuticals, and many others. This decision reflects Witty's reluctance to engage in the M&A bonanza hitting the healthcare sector these days. But the consequences are clear-cut: Glaxo's cash flows aren't stable, and its monster dividend of 5.7% probably is at risk of being cut. Moreover, Glaxo, with Witty at the helm, hasn't been able to figure out what to do with its legacy products, reportedly trying to sell them last year but later reconsidering this option. Faced with a similar situation, Pfizer restructured its entire organization to reflect the positive impact of growth products and is continuing to look for innovative ways to package its older products in a manner that will create value for shareholders. For reasons that aren't altogether clear, Glaxo hasn't followed suit in this regard -- nor has it laid out a clear path on how it plans on returning to growth. So in light of the company's falling revenues and stagnating share price, it might be time to consider a change at the top. As such, investors might want to shy away from this top healthcare name, despite its massive dividend.